Papal foot kissing ceremony at the Vatican. 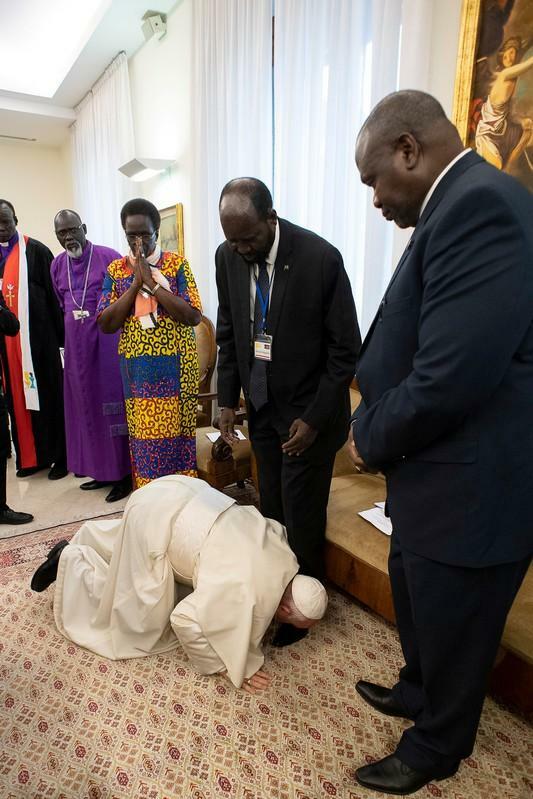 Pope Francis, in a dramatic gesture after a retreat at the Vatican, knelt to kiss the feet of South Sudan’s previously warring leaders as he urged them to not return to a civil war. He appealed to President Salva Kiir, his former deputy turned rebel leader Riek Machar, and three other vice presidents to respect an armistice and commit to forming a unity government next month. “I am asking you as a brother to stay in peace. I am asking you with my heart, let us go forward. There will be many problems but they will not overcome us. Resolve your problems,” Pope Francis said. The leaders appeared stunned as the 82-year-old pope was helped by aides as he knelt with difficulty to kiss the shoes of the opposing leaders and other people. His appeal was made more pressing as anxiety grew in South Sudan that Thursday’s coup in neighbouring Sudan might put at risk the fragile peace deal that ended South Sudan’s brutal five-year civil war. The Vatican brought together South Sudanese leaders for 24 hours of prayer and preaching at the pope’s residence in an attempt to heal bitter divisions before the country is due to set up a unity government. Sudan, predominantly Muslim, and the mainly Christian south fought for decades before South Sudan became independent in 2011. South Sudan plunged into civil war two years later after Kiir, a Dinka, fired Machar, from the Nuer ethnic group, from the vice presidency. The two sides signed a power sharing deal in September calling on rival factions to assemble, screen and train their forces to create a national army before formation of a unity government next month. In a prepared address, Pope Francis said South Sudan’s people were exhausted by war and leaders had to build their young nation in justice. He repeated his wish to visit the country along with other religious leaders to solidify peace. Others who attended the retreat were the Archbishop of Canterbury, Justin Welby, spiritual leader of the worldwide Anglican community, members of the South Sudan Council of Churches and other Catholic and Presbyterian Church leaders from Africa. Welby proposed the retreat to the Pope.